Participants will learn how to provide culturally sensitive and competent mental health services to members of the Deaf community through gaining a better understanding of the culture and its specific needs. Participants will also gain a better understanding of Sign Language and how this can affect the process of communication in mental health treatment. 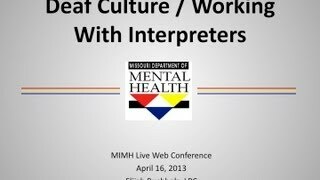 Participants will learn how ADA applies to working with Deaf individuals in mental health settings as well as how to work more effectively with interpreters in these settings.